When you’re in need of car air conditioner repair in Azusa and the surrounding area, consider Johnny’s Auto Service. We’re an ASE-certified shop with over fifty years of experience in the business, and we understand how important AC Car Repair can be in the San Gabriel Valley. Located in convenient Covina, we’re open Monday through Friday, 7:30 am to 5 pm, so you can be certain that we’ll address your car’s cooling problem promptly. Our technicians are experienced with all makes and models, we can get your vehicle back on the road in no time. Maybe your Auto AC Repair issue is minor, or maybe it’s a complex issue that you’ve let go for far too long. Your car is your second home, and you deserve to feel cool and comfortable when driving. A visit to Johnny’s can help. One look inside our clean, state-of-the-art service bays will convince you our facility is the right place for your vehicle! Our service technicians might be experts, but they’re experienced in talking to people about their vehicle’s necessary repairs. Using language you can understand, they’ll detail your AC Car Repair for you so that there won’t be any unpleasant surprises. For your convenience, you can use our overnight drop-off service, or feel free to wait in our cozy waiting area while the repairs are completed. We offer free coffee, television, and Wi-Fi. With a 100% AAA Customer Satisfaction Rating for three years running, we’re looking forward to bringing our high quality of service to your vehicle. 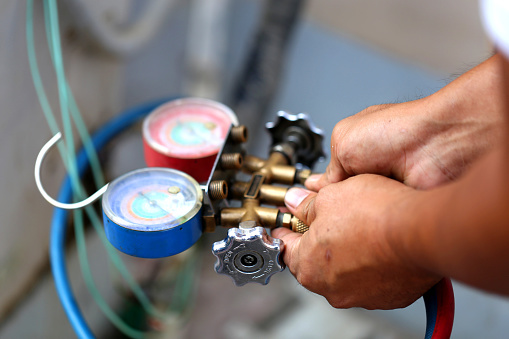 We’re more than just car air conditioner repair in Azusa. We also offer routine maintenance, such as oil changes and break service. We even offer repairs on vintage vehicles and classic cars. Let us be your car’s new service home. We can’t wait to hear from you.